You are carrying a device that has been responsible for the decimation of industries, the loss of millions of jobs and has subjected billions of people to an increased risk of fraud and bullying. This same device is also responsible for enriching our lives, bringing information and money to the billions of people living in remote and less developed regions of the world and enabling thousands of new businesses. This device is of course your Smartphone. It is a prime example of disruptive innovation. The term ‘disruptive innovation’ was coined by the academic, Clayton Christensen in 1997 to describe innovations that, at their inception, pose no threat to established businesses, due to their limited functionality. But over time, as they develop their functionality/price, they begin to nibble away at the established market, taking customers who are looking for ‘good enough’ solutions. The loss of these customers may not necessarily be seen as negative by established businesses who may well regard them as less attractive lower margin customers. But as time goes on, the disruptor takes more and more market share as its proposition grows in capability and acceptance. The result is that the incumbent, and once dominant, providers are squeezed ever more upmarket and ultimately into niche markets (see Figure 1). Christensen argues that disruptive innovations can hurt all companies – especially the successful, well managed companies that are responsive to their customers and open to new technologies and methods (see his book ‘The innovator’s dilemma’). For these companies tend to focus on meeting the needs of their existing customers. They ignore the market segments most susceptible to disruptive innovations, because these segments often have very tight profit margins and are too small to provide a good enough growth rate to attract established firms. The result is that these ‘less attractive’ market segments become the ‘beach heads’ for new value propositions that grow and develop in these segments before invading the ‘more attractive’ more profitable segments in the market – the ones that are the preserve of the established and dominant competitors. The smartphone is one of the most disruptive products to have appeared in the last two decades. It has disrupted a number of markets, including digital cameras, music and video players, portable satellite navigation, e-book readers, voice recorders, paper diaries and personal organizers and even the humble wristwatch. The subsequent growth in phone screen size is creating further disruption in the tablet and laptop markets. The smartphone is a good illustration of the process of disruption. Consider but one of its functions, its ability to take digital photographs. The first mobile phone with a built-in camera was manufactured by Samsung and released in South Korea in June 2000. It had a 1.5-inch LCD screen, and the built-in digital camera was capable of taking only 20 photos each at 0.35-megapixels in size, but the user had to connect it to a computer to share their photos. Sharp launched an improvement on this concept in November 2000 – the J-SH04 could take photos at 0.11-megapixels, a lower resolution than the Samsung, but importantly photos could be shared using mobile data transmission. This phone therefore combined the key elements of today’s smartphone cameras – picture capture and immediate distribution. By the end of 2004 the camera phone was riding high. It was reported that over half of the phones sold worldwide in the first 9 months of 2004 had cameras in them, and two-thirds of all the phones shipped in the third quarter were camera phones. Leading the way was Finnish manufacturer, Nokia. The arrival of mobile phone cameras at the functional level of ‘good enough’ was illustrated in 2013 when the Chicago Sun-Times sacked its entire staff of 28 full-time photographers and replaced them with reporters using smartphones. As well as significantly reducing the newspaper’s costs, the paper was able to increase its video content. The paper released a statement saying: “The Sun-Times business is changing rapidly and our audiences are consistently seeking more video content with their news. We have made great progress in meeting this demand and are focused on bolstering our reporting capabilities with video and other multimedia elements. The Chicago Sun-Times continues to evolve with our digitally savvy customers, and as a result, we have had to restructure the way we manage multimedia, including photography, across the network.” It was reported that reporters were to be trained in ‘iPhone photography basics’. The impact of the disruption caused by camera phones on traditional cameras was clear to see with the market leaders being squeezed into the smaller more specialist and profitable, niches such as digital SLRs. Apple has benefitted from the disruptive impact of its iPhone smartphone product on the mobile phone market since it was launched in 2007. The immediate loser was Nokia which was the market leader at the time, with handsets that focused primarily on mobile telephony and secondarily on mobile computing and entertainment. But another major player, BlackBerry (originally called Research in Motion) was also hit by the move away from the traditional keyboard to touchscreens. It is also interesting to consider why it was Apple that was the disruptor of the mobile-phone market and not IBM, whose Simon Personal Communicator introduced in 1994, was effectively the first Smartphone or Nokia, the market leader, whose Communicator series of Smartphones were successfully sold into business markets for several years before the iPhone was launched. One key factor in Apple’s successful disruption of the mobile phone and smartphone sectors was that the company primarily targeted consumers and not businesses with its smartphone offering, unlike both IBM and Nokia. This enabled it to quickly build volume and sizeable market share. It cemented this success with its complementary ecosystem built around the iTunes App store and its partners’ offerings. This enabled it to then enter the business market taking advantage of the BYOD (‘bring your own device’) movement with its customers using their phones at work and helping to convince purchasing decision-makers of their benefits. Disruptive Innovation can threaten any business. It also offers the opportunity for innovative businesses to enter new markets with the strategic potential for overcoming the existing dominant competitors. So any forward-looking organization today should have approaches and mechanisms that try and spot such potential disruptive innovations when they are still ‘over the horizon’. Indeed such disruptive innovation, used proactively, can form the core element of a powerful business transformation strategy. Unfortunately there is no one approach that can be used to identify potential disruptions early. Businesses need to select a range of complementary approaches for ‘scanning’ the business environment for potential disruptions. They also need to develop and assess scenarios of technology, competition and market changes to determine when and how they should best respond to potential disruption. Whatever approaches they choose to adopt, it is important that they are proactive, rather than planning to react when disruptions become visible – for by then it is likely to be too late. 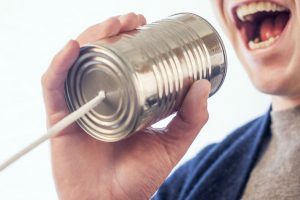 The one approach that business leaders should most definitely not adopt – is unfortunately the most common: to take a dominant market position for granted or to consider it has some degree of permanence. The business history books are full of companies that have made that mistake. This article is an extract from ‘Sowing the seeds of business transformation’ by Alastair Ross,available as paperback or e-book on Amazon. It was originally published on LinkedIn on 13-6-18. Today we are publishing the Phase 2 report of ‘The innovation journey for technology-rich product businesses’. This provides an updated report on our study of innovation practices and performance in technology-based product businesses. The study covers a total of 43 UK and Danish companies and was supported by our academic partners, The University of Exeter in the UK and The University of Aalborg in Denmark. This study programme commenced in 2009, with a Phase 1 report in February 2011. We then extended the study with additional focus on ‘Disruptive Innovation’ adding 18 more UK and Danish companies. Our study took an ‘end-to-end’ view of product innovation as shown in Figure 1. 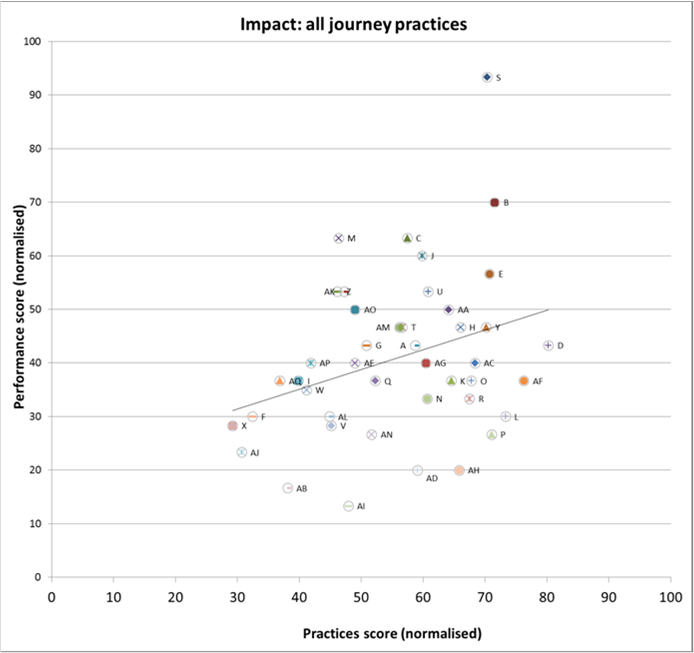 Our study found significant correlation between the practices in place across the innovation journey processes and the resulting innovation performance (see Figure 2). Some stages of the innovation journey had more impact on innovation performance than others. In particular, innovation performance leaders were typically more user-focused across the innovation journey than other companies. Specifically the leaders (i.e those companies with the stronger innovation performance) were significantly ahead in the practices applied in the ‘Idea Exploration’ and the ‘Go/No Go to Market’ stages and ahead in ‘Development’ itself. 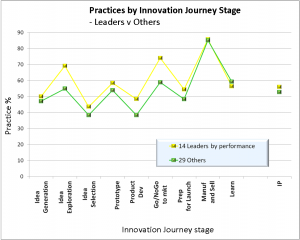 The differences between the innovation practices of leaders and others can be seen in Figure 3. We also examined how companies seek to manage the potential for ‘Disruptive Innovation’ in their market – we found that in general few companies have robust approaches in place. We have identified key learning points from this study and made recommendations for businesses who are seeking to improve their effectiveness in their own ‘innovation journeys’. Our report is intended for a broad audience of business practitioners as well as academic researchers and we have especially sought to provide clarity and application for business readers. All participating companies were sent a copy of the report together with their unique code to enable them to review their performance on an anonymous basis. Increase user focus throughout the innovation journey with the ‘voice of the user’ represented throughout the end-to-end innovation process. Keep flexible to enable late changes from users – a key practice of innovation leaders. Focus on users not customers. When it comes to product innovation, it is the users who are key. 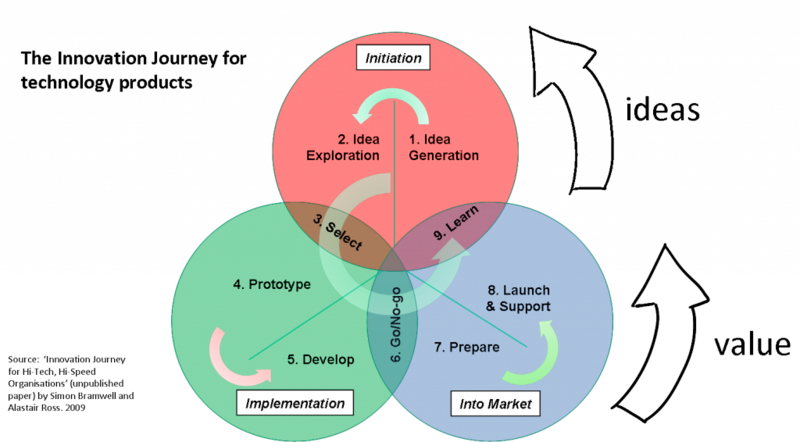 Examine your New Product Introduction/Development) process – to ensure it is covering the front end Idea Generation, Exploration and Selection steps and the back end steps. All too often these areas are not covered. Give sufficient emphasis to the management of Intellectual Property in your innovation processes. IP can offer key strategic benefits if managed effectively. Review your overall innovation system. Whilst the innovation processes as reviewed in this study are a key enabler to innovation success, there are other key factors such as Leadership, Culture and Strategy within the business that are major determining factors in innovation success. Businesses that wish to become successful at innovators need to improve their overall innovation practices. Consider the opportunities and threats of Disruptive Innovation. With the rapid development of technology and the ability for new start-ups to quickly enter a market and receive venture capital funding to support rapid growth, established businesses need to actively look out for the opportunity/threat of disruption. Overall we believe that companies would benefit in taking a broader ‘end-to-end’ view across their innovation journey to enable improved innovation performance. If you would like further information about this study or would be interested comparing your company’s innovation practices against this model, then please contact Alastair Ross.